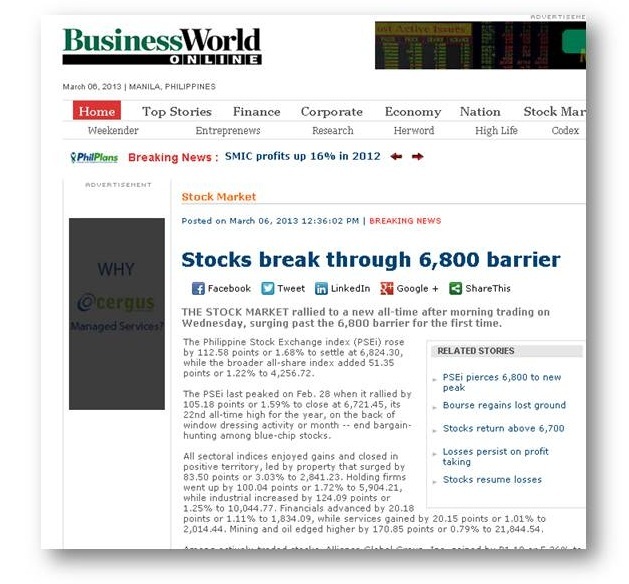 Philippines Stock Exchange PSEi Index - As of As of March 06, 2013. Breaking the 6,800 mark. NEW HIGH RECORD: The PSEi rose by 123.49 points or 1.84% to close at 6,835.21 today, its 23rd all-time high for the year. Below are some of the news related to this spike, breaking the 6800 mark., from Bloomberg.com and Bworldonline.com respectively. 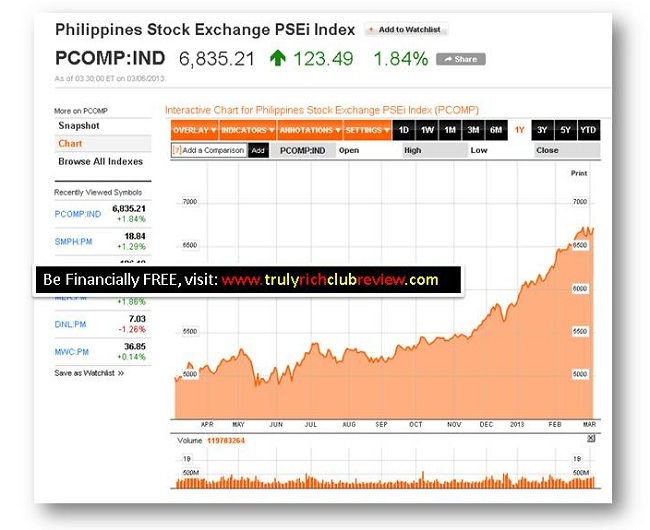 "The Philippine Stock Exchange Index (PCOMP) jumped 1.7 percent to 6,824.30 as of the noon break in Manila. The measure is poised for its biggest advance since Feb. 4. The gauge climbed 17 percent this year, the most among the largest Asian benchmark indexes, amid expectations economic growth will accelerate and the nation will win an investment-grade credit rating. 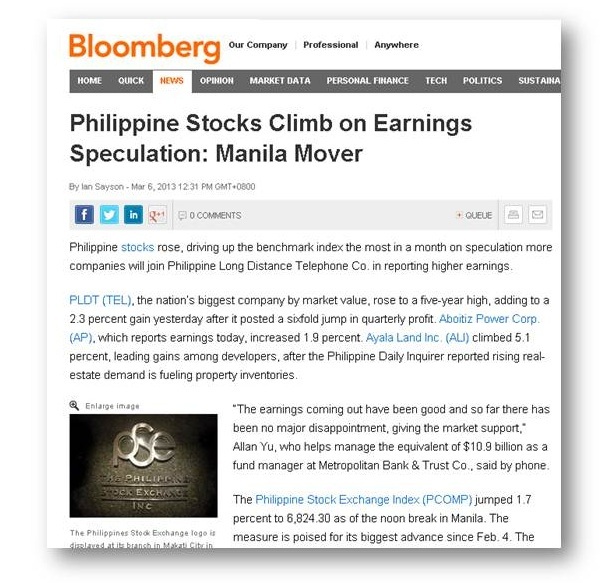 The Philippine gauge climbed 294 percent since October 2008 through March 5, making it the world’s biggest equity bull market. That’s at least 134 percentage points more than every other bull market in emerging and developed nations, data compiled by Bloomberg show." 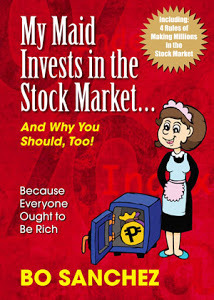 "The PSEi last peaked on Feb. 28 when it rallied by 105.18 points or 1.59% to close at 6,721.45, its 22nd all-time high for the year, on the back of window dressing activity or month -- end bargain-hunting among blue-chip stocks. All sectoral indices enjoyed gains and closed in positive territory, led by property that surged by 83.50 points or 3.03% to 2,841.23. Holding firms went up by 100.04 points or 1.72% to 5,904.21, while industrial increased by 124.09 points or 1.25% to 10,044.77. Financials advanced by 20.18 points or 1.11% to 1,834.09, while services gained by 20.15 points or 1.01% to 2,014.44. Mining and oil edged higher by 170.85 points or 0.79% to 21,844.54. Among actively-traded stocks, Alliance Global Group, Inc. gained by P1.10 or 5.26% to P22.00, while Ayala Land, Inc. added P1.60 or 5.10% to P32.95. JG Summit Holdings, Inc. increased by P1.10 or 2.75% to P41.10."